Are your New Year’s resolutions usually abandoned by March? Even with the best of intentions, many of us lose motivation before we can establish new healthier habits. Maybe you’ve resolved for 2019 to exercise more and regain your stamina and fitness. That’s one of the most popular resolutions and most of us start out great. Motivation is high and dreams of a “new” and better you fill your imagination. Then life happens. You oversleep and miss your morning walk. Then it snows, and you can’t get out for three days. The bathroom scale mocks your once bright resolve. Totally frustrated, a bag of chips seems like a good idea to bandage your wounded dreams. Is it hopeless? Of course not! Many people maintain their fitness, through life’s ups and downs, even into advanced age. Every one of them has been where you are now. The difference is they found ways to stay motivated. You are in charge. Your personal motivations are what keep you on the road to lifetime fitness. Your doctor or your best friend can tell you all day to start exercising and lose some weight. But, until YOU decide to act, nothing will happen. Your best intentions and your best excuses don’t produce results. Only you can produce results. Why are you exercising? Remind yourself frequently about why you want to get fit. Write them down and post where you will read them every day. Which of these are your reasons to exercise? Set specific goals. Instead of a goal to “be more active;” set a specific goal such as “walk 30 minutes, four times a week, by mid-February.” Being specific means listing a specific activity and how often you’ll do it, plus your deadline to accomplish the activity. If you’ve been inactive, start with five or 10 minutes, adding five minutes a week until you’re up to at least 30 minutes most days of the week. Slowly increase the amount of time you exercise, the intensity (try adding short bursts of jogging during your walk) and the frequency. Be realistic with your goals. If you’ve been inactive for a while, start slow to prevent injuries and soreness. Talk over your goals with your health care provider to be sure you can meet them without injury. Unrealistic expectations only set you up for disappointment and failure. Accept that it takes time to see improvement. Generally, the older you are and the worse your fitness level is, the longer it will take to get fit. Setting and reaching realistic goals helps you build the habit of daily activity. It’s easier to stay motivated if you have a well-established exercise habit. Aerobic activities include walking, running, cycling or any activity that involved moving the large muscles for sustained periods of time. Aerobic exercise improves heart health. It involves moving large muscles for sustained periods of time. Muscle-strengthening activity includes resistance training with elastic bands or weight lifting to improve muscle strength, endurance and power. Bone-strengthening activity includes weight-bearing activities like running, playing basketball, resistance training or jumping rope; improves bone health and strength. Balance activities can include walking backwards, standing on one leg, yoga and tai chi. Good balance reduces your risk of falling. Don’t give in to negative thoughts about yourself or your fitness goals. It is fundamentally important to stay positive – even when you backslide or just don’t want to exercise. Focus just on today and resolve to accomplish today’s fitness plan. Every morning is a new day and a new opportunity to get fit. You’ve set good goals for yourself and you deserve to attain them. Start fresh today and do the best you can. Do a little more every day or every week. Make it a priority. Fitness is not just recreation; it is essential for your health. Plan time in your daily schedule; write it down if you have to, like a doctor’s appointment. You wouldn’t dream of cancelling a meeting with your boss or skip brushing your teeth. Exercise is just as important. It’s as important as anything else you do. Gotta like it! For exercise to become a part of your daily life, you must look forward to it. It helps if you enjoy your fitness activities, but you don’t have to love exercise. However, motivation to continue is much easier if you fall in love with the results and the process. The feeling of accomplishment and pride, and the results you attain will motivate you over the long term. If you don’t look forward to your activities, try something else. Revisit the activities you enjoyed as a child. Have a plan B in case weather or life’s demands interrupt your plans. Can’t get to the gym? Walk around your neighborhood. Bad weather? Grab your walking shoes when you leave for work and stop by a mall on your way home for a brisk stroll and stair climbing. Twisted your ankle? Work on your upper body with hand weights. Too stressed to exercise? Fortunately, the best cure for stress is exercise. Regular activity is also a great way to manage daily stress. Avoid naysayers. Negative people can damage your resolve in subtle ways. Be aware of the negative impact that a friend or family member can have on your mental motivation to exercise. Be sure you are not a negative influence because self-doubt can be your biggest enemy. Revisit your reasons for exercising. Get an exercise buddy. 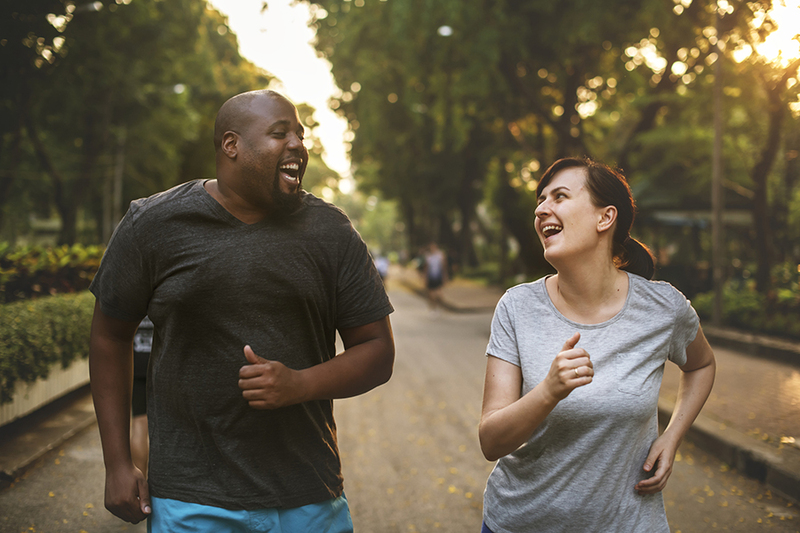 Research shows that when a friend is counting on us to show up for fitness activities, we are much more likely to be there. People who have spouses that also exercise are much more likely to meet their activity goals, and more likely to maintain them over the long run. A competition at work can use peer pressure to everyone’s motivational advantage. Match your personality with the activities you choose. If you like being alone outdoors, compete against yourself by tracking your times, distances or repetitions. If you’re competitive, consider joining a sports league or gym competition. If you enjoy others, try social activities like a dance class or cycling club. Share your goals with everyone. Tell your family and friends; post it on Facebook and ask them to reinforce your goals to provide motivation. Reward yourself whenever you meet a goal – new workout shoes or sports equipment, add cash to your own tip jar or buy concert tickets. Be sure the reward is strong enough to motivate you. Track your progress. Journaling about a new activity and tracking your progress toward goals will enhance motivation. It’s easy to see your progress when it’s posted on the refrigerator or on a cell phone app. Also, take your measurements or photos every two to four weeks. This provides positive proof that you’re making progress. If weight loss is your goal, get on a scale regularly. Re-evaluate your goals after you achieve them. As you start getting fit, you will revise what you want from exercise. Don’t be afraid to eliminate any goal that’s not working for you. On the other hand, set goals that challenge you to do more and do it better. Do your own research on fitness. It will motivate you in a different way and let you see different possibilities and opportunities. Let technology help by trying cell phone apps that track exercise and calories. Check out fitness videos at the library or watch exercise, yoga or Pilates shows on your public broadcasting channel. Address your personal barriers. Write down the top three barriers that have killed your motivation to be active in the past. Make a plan to overcome each one of them. Post these with your goals. Journal about ways you have overcome barriers. Chores count towards your daily activity goal. Look for ways to add activity to your daily activities such as parking far from the entrance when shopping, raking leaves, jogging with your dog, lifting hand weights while watching television, or taking the stairs. All activity counts toward your daily total. Pay attention to your fuel. You can’t be active if you have no fuel/food on which to operate. Staying well hydrated is also important. Oftentimes, what we think is hunger is really thirst. Drink water before and after exercise; before meals if you are trying to control weight. It’s inevitable that there will be days you cannot exercise. Remember to adjust your calorie intake to compensate for inactivity. Expect setbacks and don’t let them make you feel like a failure. Start each day with an activity plan for that day. Forget yesterday or what you might accomplish tomorrow. Focus on what you’re doing today to be healthier. Here’s to a healthier you in 2019 and a lifetime of fitness and good health.